We allow a maximum of 6 overnight guests. Some exceptions will be made for additional children. Please contact Brent at 760 402-3628 to discuss these exceptions. With more than 4 guest, a $15 fee per additional quest is charged per day. Falsely representing less quests than are actually staying can result in loss of all deposits and immediate eviction. Hurricane, Tsunami or Storm Policy: No refund will be given unless a mandatory evacuation order has been given by the National Weather . In the event a mandatory evacuation order is issued we will refund unused portions of rent of a guest currently occupying the property and any advanced rents or deposits collected for a guest that is scheduled to arrive during the evacuation period. Check-in time is 3 PM and check-out time is 11 AM. Please be certain to plan your arrival and departures times accordingly. An early check-in time or a late check-out time may be available and is subject to a fee. Please contact Brent for more details. Central air conditioning is available at a rate of $15.00 per day. Great condo. The view is amazing. Will use again next trip. Place is like home. Everything is there and convenient. Place on the resort has a BBQ grill and 3 pools. Assigned car ports. Gated resort. Under great management and friendly staff. Made our trip memorable. Oceanfront condo located in the best building at the resort. Directly oceanfront with sunset views and all of the wonderful delights that come with being right on the water in Kona. Fantastic view from Lanai - This unit sits out further than most give you views not only straight out but down the coast line also! Best of all your view is not obstructed by other units. We had a great stay. The condo was excellent. I would recommend this condo to anyone. I cannot say how beautiful the view is, oceanfront. We sat on the Lani a great deal of the time although you get sun late in the afternoon. For a rental condo the furniture was exquisite. Loved the master bedroom and bathroom, huge. Very handy washer and dryer. Covered parking is nearby. I would highly recommend taking the air conditioning option gets warm in the afternoon. We did not cook so cannot comment on kitchen setup. There is an flight of stairs to get to the main level. Another flight to get to the third bedroom. They unit is right on the water with a great view. Living space very comfortable. Kitchen well stocked with plates, pots and pans and utensils. The ocean pool is well kept as is the entire complex. Good location to go north or south on the Kona Coast for daily activities. A small harbor is within walking distance. Had a great week. We have had many stays at the Kanaloa at Kona condos, and as usual, this was another wonderful experience. The condo was very nice although did not have the extent of amenities as other condos we have rented in this complex . The condo decor is nice, has a good lanai and view, and the proximity to Kilauea-Kona is great for day trips and activities both north and south of town. As always, a stay in these condos is a great vacation! This condo has fantastic sunset views and is spacious. We also really enjoyed the ocean view pool. It also came with beach umbrellas, towels, snorkel gear and a good sized cooler. There a few things that could make this a more comfortable stay.The beds were very uncomfortable - the hardest we have ever slept on. Everyone in our party commented on this. It could really benefit from newer mattresses, or at least mattress pads. Also, the towels were a little tattered and the guest shower had signs of mold. The view was Amazing the condo was nice. I think the cleaning staff could do a better job, it definitely needs a deep cleaning bathrooms kitchen cabinets etc. baseboards and patio and kitchen outside I feel should have been much cleaner an extra blanket would be nice and the carpet I feel should’ve been cleaner we did have an issue with the air conditioning wasn’t turned on long before we arrived and it was extremely hot and humid and was uncomfortable the first evening but other than that like I said the view was amazing and kona is beautiful. Brent is a very nice owner and Tom the manager Made us feel welcome.We look forward to coming back next year. Great place to stay. We loved our stay at Kanaloa at Kona, Condo #1803. The Condo is beautiful and so homey, clean, and well equipped with everything needed for cooking and play at the beach. The views from the lanai with crashing waves on the lava beach are stunning. We ate all our meals outside. Kitchen is big enough for 4 people to prep and cook. The master bedroom and bath is gorgeous and spacious with walk in closet, large dual shower, dual vanities, and washer and dryer. The complex is beautiful, safe, and peaceful. Just wanted to let you know that we really enjoyed our stay in your lovely condo! We are looking forward to our return on this Saturday. I do believe you have one of the best condos at Kanaloa. The stone floors with the rugs are very nice as well as the new carpet! And all of our guest adore the new bed in the second bedroom. My pregnant daughter was especially happy with that bed and all of the many pillows. She and her husband were very comfortable! As you probably already know it is very hard to leave the lanai. We could easily spend all day there. And your living room couch is so comfortable. I like the way you have done the upstairs loft with the double bed with one twin. I think that is a good idea! Excellent condo, great location, well furnished!! Property and pools wonderful. Had a terrific time, would definitely go back. Brent was fantastic to work with, very responsive!! Loved the condo. Plenty of room. Master bedroom was its own apartment. Very large. Loved having a washer and dryer. The 15 dollar charge per day for A/C was well worth it. Very quiet and peaceful. Landscaping was very nice. Great views. This condo was perfect for our family - 3 generations. We especially enjoyed the location right on the waterfront with crashing waves right below the lanai. The kitchen was well supplied. The unit was especially clean and well painted. There were lots of towels and toys for the kids. Suggestions: Leave better instructions how to turn on the TV. Thanks for sharing your property. Love this condo. Our second visit. Great view from the lanai. Our favorite part is proximity to Keauhou bay and all the water sport options there. We kayaked, paddleboarded and snorkeled without having to drive! Also close to the kta and good Saturday farmers market. Dramatic setting with waves crashing just below the lanai. We really enjoyed this condo. The location at the corner of the property closest to the water is outstanding. Great location and view. Lots of space. Very nice place. The Lanei is fantastic. Stunning and majestic are weak starters to this description. The condo is spacious and nicely appointed and equipped. But the true attraction begins about 50 feet off the lanai where the Pacific assaults the black volcanic shoreline. Every 15 seconds a wave crashes in with larger swells about once a minute that launch geysers of white water spewing to the sky. Don't bother with the televisions, the real show can be seen and felt right outside. This is a wonderful place. Beautiful home, clean and very comfortable facilities. Onsite management staff helpful and friendly.Ocean Views from the balcony was awesome and very relaxing. There is nothing to complain about this lovely property. We are so blessed have been able to stay here from our vacation. Excellent condo. All amenities in the condo were exceptional. The view from the lanai is breathtaking. A few of the resort amenities needed attention (grills that didn't work, cold hot tubs), but other than that, everything was great! Great large appartement with perfect ocean view. Kanaloa at Kona is very nicely held with great pools. Great location for Island excursions and beaches. We stayed in 1803 for the second time, and found it to be a great place for our home base for our adventures in Hawaii. We had two couples and three kids, and everyone was very comfortable in the condo (and the kids LOVED the pool). The kitchen is fully stocked with just about every cooking appliance and tool we could ever need, which made cooking for the crew pretty easy. Our favorite is the lanai, with the best view in Hawaii. I will definitely look into returning to 1803 should our travels lead us back to the Big Island. Thanks, Brent! Fabulous place on the Big Island! Stayed at this condo at the Kanaloa at Kona Resort and it was terrific! The condo was beautiful and the views from the lanai spectacular! We enjoyed watching the sunsets and we saw dolphin in the morning. Lots of amenities included to make a trip to the beach quite enjoyable, from chairs and coolers to snorkeling gear. The resort is very quiet and the grounds are so beautiful! This was our 4th time staying at this resort, already looking forward to our next trip! We have stayed at another condo in Kanaloa at Kona and this one has some great upgrades. Everything you need is there, checking in and out is a piece of cake. Right on the water, and further out than the other buildings, the view is unmatched! We were very happy with our stay in 1803!! Aloha! If you're looking for a place right on the water, this is a great unit. The condo is updated in all the right areas and it provided a very relaxing vacation for our family. Kanaloa is a well maintained and very low-key development. I wouldn't hesitate to recommend this condo to anyone. This condo is ideally situated within Kanaloa at Kona. It's beautifully decorated and the kitchen is nicely appointed. Brent and his manager Tom were easy to work with. Right on the water with great sunsets. Nice amenities with several pools at the facility. Clean and updated. Elbow room for many at the condo but it was really nice for just my wife and I. No beach... but there are no real beaches in the area. Town is real close with plenty to do, eat, and shop. Check in day one as the resort has a welcome package with recommendations/coupons and certain events book up early. You might even call ahead to see if they can help in advance. We loved our time at this condo. It is clean, spacious and comfy. The view is amazing and you cannot get any closer to the water. We enjoyed sitting on the deck watching whales and dolphins! Condo is a short drive to town, snorkeling, shopping, etc. I would highly recommend this place to anyone who wants to be close to the action but stay somewhere quiet. This condo was extremely well equipped, luxurious and surrounded by the lulling sound of waves with a beautiful view from the lanai. You can't get any closer to the ocean. We enjoyed the "peaceful easy feeling" at this comfortable place with astonishing views of the ocean and dreamy sunsets. We loved the condo, everything was perfect. The unit was clean and spacious. The view was nice. The bad thing was there was construction on the unit next door. They were loud and started way too early! Seems since this is a vacation resort they would take that into consideration and not start so early. The kitchen pans could use some new frying pans. The condo was wonderful. Beautiful view. My family would stay there again. Our family was so fortunate to discover this wonderful Kona condo for a series of three milestone celebrations during July. Unit 1803 was the perfect location for the six of us who gathered to observe an 85th birthday, 80th birthday and 60th wedding anniversary. The condo was perfect for our needs, well equipped with everything for cooking, dining, beach going, and sleeping arrangements. We were delighted to have air conditioning to cool off the condo at the end of the day and the laundry was much appreciated. The view from the lanai was breathtaking and much of our time was spent reading, visiting, playing games and enjoying celebratory meals there. We made a lot of use of Kanaloa's three great pools and community bbq's. From the convenient location we were able to head out and explore the big Island. A big thank you to Brent for his contact and help before our trip and after. We would definitely consider staying in unit 1803 when we return to Hawaii. It lived up to the pictures on their website and then some! The pictures on their website really made this unit look amazing with an amazing view. The price seemed more than reasonable for what they offered. I booked it hoping it would live up to the hype. It surpassed expectations! The view, the expansive unit, the stylish and comfortable decor, and all the unexpected surprises (eg. the huuge master bathroom with a walk in shower, a closet full of beach supplies and the fully equipped attractive kitchen with (koa?) cabinets. I could have sat outside on the lanai, admiring the view and listening to the crashing waves all day. The complex is very user friendly, with bbq grills which we took advantage of, two small pools and a sauna which my boys took advantage of and nearby a shopping center with decent restaurants and a good local grocery store we often frequented for everything from bentos to wine to various food supplies . It's also conveniently located just south of the main area of Kona so you are not in the middle of tourist alley but with easy access to the main highway for any trips to anywhere else on the Big Island The owner gives you detailed and simple instructions for check in and check out. It's easily in the top five of places i've stayed in while traveling. Trust me, its even better than the website and pictures suggest! So, why not five stars? If i could, i would knock off just half a star but i cant seem to do that, so i will knock off one star just to call the owner's attention to a couple of negative details: Having glaucoma, i have trouble seeing in dim light conditions. Two of the ceiling track lights in the living room didnt work which left the unit a bit darker than i would have preferred at night. Also, the switch for the two lights illuminating the stairway up to the loft was broken. This was concerning to me because my youngest son was sleeping up there. Finally, the first time i sat outside at the table on the lanai to admire the view, my bare feet felt alot of sand and grit under my feet. At first i thought it was just sand the wind had blown in that day. I started sweeping with a broom i had found. The amount of sand i swept out surprised me, There was ALOT of sand, way more than would accumulate in one day. I didnt want to sweep it out over the lanai unto the unit below so swept it into the closet on the lanai. I contacted the property manager and he told me the owner was aware of the issue with the lights. I told him I was concerned about it as a safety issue but he gave me no assurance they would fix it. I considered replacing the switch myself, a simple fix but decided against monkeying around someone's else property. Thankfully, when i returned from the beach the next day, it was repaired by maintenance people. Regarding the cleaning, he explained to me the cleaners were in a rush that day, being swamped with other units. While that may be true, I felt irritated that I paid 200 dollars as a cleaning fee only to find myself cleaning up the unit the first day i was there. These negative details were annoying but of small significance in contrast to the truly outstanding superlatives of our stay there. The view, location, size, amenities and attractive style of unit make it a winner. Would i stay there again? Absolutely! I look forward to returning. One tip: you absolutely want to pay the extra fee for air conditioning. The unit gets hot without it. This was the perfect home base for our family in Kona with our 3 boys. Just a few minutes up the road for excellent snorkeling at Kahalu'u, we saw tons of fish and quite a few turtles. Several gorgeous beaches less than an hour north toward airport (Manini'owali, Mahai'ula & Makala'wena). The unit had boogie board, umbrella & chairs which worked out great. The view was gorgeous and the sound of the waves crashing was awesome to hear when going to sleep. Also enjoyed the sea side pool nearby with access to walk along a rocky coastal path. The A/C option made things nice and comfortable, probably not necessary for everyone as there are plenty of windows to get the air flowing, but having the A/C for us it was worth the extra! Wonderful view and nice condo. There are a whole flight of stairs upon entering the unit but once up there it is worth it. Very spacious and nicely stocked with towels, kitchen supplies and beach chairs. Great to have wifi and speakers for our devises to play music. The air works great and the fans really helped too. We went with my in-laws and our kids and it was the perfect set-up besides the stairs entering the unit. The accommodations at the complex are great with 3 pools and tennis courts. We were able to check out rackets and balls for the tennis. The ocean pool was our favorite. I would absolutely stay in this unit again. Our family-My adult son and daughter and grandson-5 yr. of age-myself and a family friend visited Kona May 13-21 2016. ( 4 adults and one child) stayed in the Kanaloa unit 1803.I have stayed in several other units in Kanaloa over the past 10 years and this unit was the best by far! From the moment we walked in the front door we relaxed- spectacular private location in the complex with unobstructed panoramic views along with a beautifully updated interior including a well equipped kitchen with granite counters and stainless appliances. This was important as we did entertain and cook- in for several meals. We will put this condo first on our list for our future visits to the Big Island! We also want to comment on the friendly Kanaloa maintenance staff and security. They were present and attentive but did not impact our privacy. Mahalo to Brent -the owner and to Aloha Condos management. Best condo in the place! We rented this three bedroom condo not knowing much about it. I was so happy to discover we had the best location on the property, with a panoramic view of the ocean and the waves crashing on the lava cliffs below us, and a nice patio and table outside to enjoy it. I had my coffee out there every morning. The unit was clean and updated. The master bedroom and bath were huge! The property has a few pools and tennis courts (unfortunately no gym) and is laid out nicely with lots of guest parking. Booking and payments were easy and we had a blast. Highly recommend it! We loved this Condo! Condo #1803 had breathtaking views, everything we needed and wonderfully comfortable beds! We stayed for 4 days and at the end hated to leave. Wonderful Ocean and sunset views from the kitchen, dining and living room. My daughter loved the upstairs loft for it's nearness to the ocean and the sound of the waves. Even though there is no door, it is far above so there is plenty of privacy. Everything we needed was right there including, beach towels, chairs, snorkel gear, boogie board, extra towels, good books, regardless of your interest, this condo has it. I would gladly stay here again. For the 2nd time I stayed in Unit 1803. It had been updated since 2013, and was again just a wonderful home away from home. The unit is perfectly outfitted with everything you need for a vacation, it's comfortable and very well appointed. Thank you so very much for another relaxing vacation and I highly recommend anyone staying in this unit. This was our second time staying at Kanaloa at Kona and again it did not disappoint! Condo 1803 is literally right on the ocean. The condo itself is well appointed with everything we needed. It was clean and was well stocked for cooking in if that is what you like to do. The lanai was unbeleivable and was almost too close to the beautiful blue ocean (did I just say too close?) as it was a little loud to hear someone inside the unit trying to have a conversation. I would definately stay at Kanaloa at Kona again and if possible this is ther unit I would rent! Super condo and amenities (incl. new granite counter tops). Well appointed and spacious. Great view of the ocean and sunsets. Again want to thank our host (Brent Melbye) for use of the property. The Kanaloa at Kona complex is well kept and attractive. We LOVED this condo!!! The view is stunning and the condo is beautifully appointed. We were in want of nothing. We plan to come back and this is the only place we ever want to stay. We have always traveled to Hawaii using our timeshare in Mexico as trade bait, but for this trip we needed a place bigger than we could get thru exchange, as we had four adults and three young kids. This place was ideal for our party. Plenty of room, comfortable furnishings, and the lanai is the best place for mai tais and sunset viewing we have ever seen. Reservations and communication with the owner were quick and efficient. All in all, a great place, we will definitely consider a return visit. This is a very clean and well maintained unit right on the ocean. There was plenty of space for all 5 in our party. There were plenty of amenities e.g. dinnerware, glassware, towels, boogie boards, etc. Very conveniently located close to Keauhou Shopping center, although the deli and bakery at KTS market was not open due to renovations the week we were there :-( There were a few tiny ants that appeared when we left food on the kitchen counter so we just made sure the counter was clean at all times. You can't go wrong with this unit and I would stay at Kanaloa again but i might choose a condo closer to the pools. We enjoyed our stay at 1803 and found it exactly as advertised. No surprises. The unit was clean and well kept, and we had a great view and sound of the pounding surf. The recliner chairs in the living room were especially comfortable. The complex is located midway between sights to the south and sights to the north, so we felt this was very convenient. Unit 1803 was exactly as advertised and 100% in line with our expectations. The unit was clean, well furnished, and right on the water. The crashing waves were a stones throw away and the views from the lanai and the living areas were well framed. For the price and location, we were entirely satisfied and felt it provided very good value. The email exchanges with the property manager were professional and helpful. The time spent at Kanaloa was fantastic. This was the year of whale and dolphin sighting. There was never a time on the Lanai when you could not see a whale broach or dolphins swim by. In the thirty years of visiting Kona and Keauhou we have never seen this display of wildlife. The weather was perfect and kept us outdoors doing things fun. We spent every evening watching sunsets and eating on the Lanai. The facility was perfect for our long stay. It was stocked with all the items we needed for cooking great meals. The closet held several beach items that came in handy also. The washer and dryer kept our clothes clean and fresh. The pools and jacuzzis kept us relaxed. The location was quiet and well removed from the traffic and hustle of downtown. Very pleasant stay, enjoyed the view. Nicely furnished and the amenities were easily accessible. appliances were a little dated but still functional. .
Great oceanfront views, one of the best units at Kanaloa. Nicely furnished. Lots of attention to detail in this unit. The kitchen had good utensils, lots of spare spices, nice glasses and a good fridge. The TV was above average, with comfy seating watching the sunsets. Good wifi. The beds were not too soft nor too hard. The AC worked well. There were 3 of us, and another 2 could have slept in the loft. Thanks for providing a great place to stay. 1803 provided us with a wonderful stay as we joined family in other units to support our son as he did the Ironman. The unit provided us with all our needs, including a variety of dishes and cooking utensils as well as nice linens and towels. We took advantage of the clean grills available on property as well as the pool. Other than a smoke detector which beeped all night long on our first night, we had a great time. This meets and exceeds all expectations. Second year in a row that we stayed in this unit. Reason for return is simple. It's the best. Hope to be able to return again. We had a great time staying at this condo, it's huge and has everything you need for a great stay. Amazing views, massive rooms, well stocked kitchen and plenty of snorkelling gear, tennis racquets and things for the beach mean there's no need to pack anything. We'd definitely love to stay again. The condo was well equipped for a comfortable stay. The veranda provided beautiful ocean views up and down the shoreline. We saw whales breaching on more than one occasion while relaxing there. The kitchen cupboards were well stocked, plus having a wide array of beach accessories in the hall closet. There are 3 public barbeques available for use, along with 3 community swim pools each having a hot tub area. The ocean view pool was a favorite, and an adult only pool that was open until 10 pm that was great for a relaxing evening swim. I wouldn't hesitate to rent the same place on our next visit to the Big Island. Outstanding waterfront sights and sounds. We have stayed in the Kanaloa complex a half dozen times and have enjoyed them all. This location is ideal for those who want to be right on the ocean breakers but away from the craziness of Kailua downtown. This condo was very well stocked with whatever we needed and was comfortable for 4 travelers; the full kitchen saved a bunch of money on meals. Being upstairs meant that there was no noise from feet above. We made use of the pools, spas and tennis courts and even swam at the adjacent cove beach although it is a tricky entry/exit.Only down side to our stay was having to vacate for one morning for pest control spraying.Aloha Condos was very easy and pleasant to work with. We would come back. This trip was my 7th stay at Kanaloa at Kona, but my first in unit 1803. It is a fantastic Condo. It had everything that we needed. The location on the water is perfect, we were greeted every morning with a "whale show". We also saw dolphins on several occasions. The owner was easy to work with, and the onsite contact was very attentive to our needs. The resort is immaculately maintained and beautiful. The resort staff is very friendly and helpful. I also like the location which is a little south of downtown Kona, about a 15 min drive, which makes it much quieter and less touristy. The resort also borders the Kona Country club which is a very nice golf course, that was unfortunately closed for renovation right now (re-opens in the Summer of 2014). The other world class golf courses (Mauna Kea and Mauna Lani) are about an hour drive away. I go to the island to relax, watch whales and play golf and I always bring along a couple of friends, they all return home raving about the resort and wanting to come back. If I had one tiny little nitpick, it was the TV in the master bedroom, it was small and low def, but the local contact told me they were upgrading it. Unit also had a brand new refrigerator. The owner seems to be adding upgrades all of the time. Overall this is an amazing place and I will definitely be back in Feb of 2016. We were really impressed with this condo. While it was furnished with upscale furniture it was also very comfortable and family friendly. We had the master bedroom and I couldn't believe how comfortable the bed was. I had a little trouble applying my makeup in the bathroom until I saw the large vanity area with a vanity mirror to boot on the other side. It was also really nice to have a full-size washer and dryer in a separate laundry room and not those stackable kind in a closet. The view from the lanai is spectacular. One afternoon whales were breaching right in front of us and sipping a mai tai while watching the sunset doesn't get any better. My daughter and I spent 2 fabulous weeks in Unit 1803. This is one of the best units in Kanaloa. I have visited there and stayed at Kanaloa many times. The master bedroom is updated and very well appointed. The furnishings are top notch and it is stocked with most anything you need. The unit was very clean and we enoyed it very much. I would highly recommend this unit. If you love the sound of waves, and want a Great Oceanfront View, this is the place for you! It has 3 great bedrooms, 2 full bathrooms, a very Well Equipped Kitchen, and Very comfortable Living and Dinning Room, All with Great views of the ocean. But Best of all is you will spend almost all of your time out on the Lani, watching Dolphins, boats, kayaks and swimmers pass by. When you do leave to go snorkeling you are about 5 minutes by car from turtle beach and 10 minutes from White Sands Beach. we went to Two Step Beach 2 times and loved it, it is about a 15 to 20 minute drive.There were 2 couples in our party and we all Loved this condo and will definitely rent it again. It is a great location, right across the lagoon from the Sheraton where you can watch Manta Rays at night free from there deck, or book a Manta Ray Night Snorkel. You need to book these night snorkels in advance, they fill up fast, or you can watch them from your Lani with the binoculars they have at your well equipped condo. We took day trips to Waikoloa to check out the beaches and several upscale Hotels like the Hilton. We all agreed that we were much happier with our great condo because of all the room we had and also the beautiful grounds at Kanaloa at Kona. it has nice tennis courts and 3 swimming pools. I only used the one the was Oceanfront and it was beautiful.We cooked breakfast everyday and dinners about 9 nights out of our 14 nights there. There were spices, sugar and salt, and even olive oil there for us to use. we bought fresh fruit and supplies from the grocery store that was just up the hill about 3 to five minutes by car.This is a great place to feel at home on your vacation and We will rent it again hopefully next year. The Snorkeling, shopping and dinners out were great! We loved Hugos on the Rocks and had Mia Tia's and dinner there 3 times to watch the sunset. We also had dinner at Pancho & Lefty's Mexican Cantina, very good food. 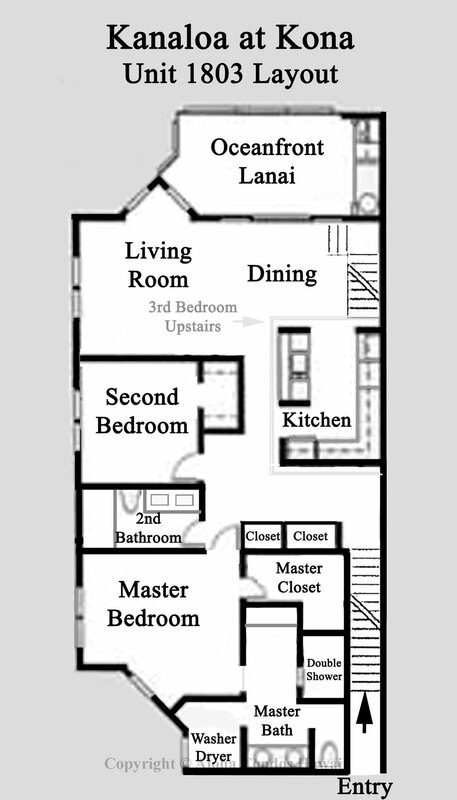 My wife and I stayed in Kanaloa Condo 1803, while our sons and their families stayed in nearby units. 1803 is certainly one of the nicer units in the complex. We are prairie people so we found the waves crashing so near a little tiring, but our family found it soothing. What can you say! The unit is spacious, clean, well kept and comfy. The the grounds and the amenities:tennis courts, Bbq's and swimming pools are well maintained. The location and the acomodations are fantastic. I liked the location right at the shore and I liked the well stocked cupboards including snorkeling gear. The unit was fantastic. Everything from the ocean front views to the comfortable interiors. It felt like home after just a few minutes. The amenities were great. Totally thrilled with the entire experience. We loved this condo and the spacious feel of it, especially the large master bedroom and bath. Very clean. It was nice to have it already stocked with hand soap, paper towels, toilet paper, tissues, lots of bath towels, beach towels, snorkel gear, coolers, etc. We loved the pool by the ocean! Ideal location of the condo - was close to Kona and the airport. The condo is right on the ocean with a very private lanai. The owner has an entire closet filled with beach chairs, boogie boards and other items that made our trips to the beach very enjoyable. The condo is clean and again the owner has provided tons of clean towels and beach towels for your use. The master bathroom is huge and the shower is great! Take advantage of the information left in the condo regarding places to go and things to do. It's a good idea to call restaurants or shops first to make sure they are still in business. We opted to pay for the a/C and are so happy we did! The M/B is in the rear and we had some days when the ocean breezes weren't strong enough to cool the condo down at night. While the unit is not modern, any deficiencies are more than compensated for by the spectacular view and the sound of the waves. We stayed a month; it flew by. There is a long steep flight of stairs to this second floor unit so not for everyone. The resort is well located, the grounds, pools etc are immaculately kept. Professional, yet friendly dealings with owner, and local agent responsive. I'd go back in a heartbeat. The location of this condo was great, both within the complex and on the Kona side of the island. It was minutes away from snorkeling, paddle boarding, kayaking and an outrigger canoe club that allowed visitors to go out with them. The price is a little less than some of the other condos because only the master bedroom and bath have been recently remodeled. The rest of the unit is in need of paint and a few minor repairs. It could also use a thorough cleaning. That being said we spent very little time indoors. We did enjoy the deck overlooking the ocean, choosing to eat all our meals outside. We loved this condo. The view couldn't have been better, and the unit was spacious and comfortable. Our toaster broke and the property manager brought over a new one first thing the next morning - very responsive. If there is a downside, it is that it's not walking distance to Kona, but for many that would be a bonus. We'd use the same condo again in a heartbeat. The condo was spacious and clean. It has all the convenience and comfort of home. A few minor things that were broken (one stove knob, closet sliding door) and a few things that can be improved such as some of lightning switches should be labeled (I have no ideas what some of them are for.) The front door key hole was in a very awkward position and hard to open especially at night. The Wifi password was labeled all capitals but it was actually all lower case.However this is an excellent condo, and you can not do wrong staying here. The condo had a beautiful view of the ocean, Lots of amenities. Golf, ocean activities all very close by. Very clean and modern and well equipped. The view from this condo is magnificent - you are looking out into the vast ocean, and how soothing it is to listen to the sound of the crashing waves. Travelling with my husband, two sons (23 and 14), and my mother - we absolutely loved this condo - spacious, clean and well furnished with everything (including WiFi), we couldn't ask for more. The owner had several folders with tons of information, maps, attractions, restaurants, etc., which were helpful and useful. Can't get much closer to the ocean! Watched dolphins and whales in the little time we spent in the condo. With the exception of a few very minor things, the condo is in nice shape. Very open. I ended up being noble and let my son and mother take the 2 big beds downstairs but ended up thinking I chose the best bedroom in the loft! I was able to see the waves crashing in and there is no better sound to fall asleep to! Pure heaven! There is no restaurant at the resort, despite the description but there are several nearby. Very nice area. Quiet but close to whatever you want to do. Closet is stocked with beach toys that we really enjoyed! Thanks!! We had such a great time during our short stay. We loved the condo, loved the amenities, loved the location. The reservation process was so easy. We highly recommend this condo to anyone looking for a great and relaxing vacation. Great spot, what Hawaii is all about. Condo was fabulous. Views spectacular and great whale and dolphin watching from lanai. Very comfortable with plenty of room - felt like we were in our own home. Great location and very quiet complex yet easy drive to all the action in Kona. Of the 3 pools our favorite was the one by the ocean. Complex is close to Kona Golf Course where we had great breakfasts and lunches at their restaurant. Best part was drinking Mai Tais and watching the sun set from the lanai. Can't imagine a better way to end the fun filled days. We will definitely stay here again! We loved this condo! We've rented many condos/homes on the island and this one is by far the best view ever! There were five of us and this condo could easily sleep 8 if needed. It's in a quiet location, yet only minutes from shopping and downtown Kona. We loved it!We had breakfast on the Lania every morning watching whales and dolphins, couldn't have been more pleasant. We enjoyed our stay thoroughly. The condo was very clean and warm to stay. Loved the decor. They had books and maps of attractions which was very useful. Location was perfect and spent most of our time in the beachfront lanai. Theres a KTa superstore nearby to stock up on groceries and snorkeling activities was just a 5 min drive from the condo. We had a fun time barbecuing in the resort. We would definitely come back again :) We wish there was a can opener in the kitchen :) Everything else was great!! One of the best locations on the Big Island. Can't beat the views of the ocean from this condo! Sitting on the lanai, hearing the surf and watching the sunset was really relaxing. The condo pretty much had everything we needed so we felt right at home during our stay. The place was nicely decorated and the complex grounds are well kept too. An extremely enjoyable place to stay! Kanaloa in general is a great complex, and this condo is no exemption. Spacious living area that's well-appointed with a good sized lanai directly on the ocean where you can watch the sunsets. We have stayed in several of the condos at Kanaloa and this was on par if not a little nicer than the other ones. 2 bedrooms and loft easily sleeps up to 6 and has 2 full bathrooms. I would highly recommend this condo to anyone traveling to the Big Island. We have stayed in Kanaloa before. This was a very nice unit - very clean and stocked with supplies and the boogie boards were a hit with the kids. Fantastic oceanfront view. And thanks for the gift basket. Relaxing as always but the condo needs work. The condo is well situated but poorly kept up. The sliders to the deck are all but unusable, the light fixtures and/or lights are not working in about 10% of the place, the blinds need repair, the ceiling fan in the master bedroom is noisy at certain desirable speeds and the refrigerator may need coolant topped off (it refused to work for the first 12 hours we were there - following a shutdown - I suspect due to a "vapor lock" in the coolant system that resolved itself in the cool of the night). The property manager was helpful in bringing ice to keep our food cool until the system kicked in. With appropriate repairs this would be a prime rental within Kanaloa - which is a prime complex.We have stayed in various condos here over the years. This was probably in the worst condition even though it is in a prime spot. absolutely the most perfect location, grounds, beautiful. The condo was great, big and huge master ensuite. Downside the 3rd bedroom is a loft, so no privacy, and need to be quiet for sleeping teens? Also, furniture is worn and dirty, stove did not work well, kitchen needs updating.